Guest Host Carl Anderson How’s it Going? The numerous times that I have seen Carl speak at Teachers College Reading and Writing Project and the most recent when I was able to participate in his section during the writing institute last June always causes me to pause. The thing about Carl is that he takes something, which arguably is the most challenging part of the workshop model and puts it within your reach. He makes sure that no matter what your experience is you can sit next to a child and begin to help that child become a better writer. Carl shows us that conferring is about building relationships. When we approach a writer for a conference and think first about building the relationship or getting to know the writer it does not seem so difficult. It allows us to begin to confer with students in reading and writing. Carl often says, “You cannot get better at something unless you do it.” This I have heard him say numerous times when talking with teachers who share their struggle or sometimes worries about conferring and getting it right. When we approach the conference through the lens of a getting to know a writer, the pressure reduces and we can just do it! In turn each and every conference we have will teach us to become better at conferring. Relationships then develop as we open the conversation with our writers. We can begin to help a writer grow as we get to know them and develop a trusting and supportive environment. Writing is risky, and that trust and support is necessary so that a writer will take the risks they need to as they develop their writing. Writing is also very personal, and that too requires a trusting, supportive relationship. Conferring is an opportunity for reflection. In a conference it helps the learning process to allow some space for reflection. As the teacher, it seems that the first point of reflection comes when I review my conferring notes from my last visit with the writer. The next reflection point comes after I research what the writer is doing or after the writer tells me how their writing is going. I need to reflect on this in order to make a decision as to what I will teach that writer today. In reflecting on that I need to identify something that the writer will carry with them not only on this piece, but to other pieces they write. This is consistent with Lucy Calkins’ message in that we focus on teaching the writer, not the writing. Making this decision is significant enough to require a moment of reflection. Additionally, if we want to maximize the learning experience for the teacher and the student we have to consider John Dewy’s wise words, “We do not learn from experience… we learn from reflecting on experience.” Often making space for the writer to reflect or process their thoughts is a time when I jot my notes or reflect myself, this helps me to make that quiet time for the writer to reflect. Writing is all about the revision, this is the most powerful, yet difficult part of writing. The reflections allow for the possibility of revision which is the pathway to improving the work of a writer. Each time a writer makes a revision the writer is trying a new move, and these moves can be used on any writing. The writer takes these moves with them everytime they write. Revision for the teacher who is conferring I would argue is just as important. Once I reflect on the writer, I can make revisions to my teaching plan for that writer. That revision becomes another conference or teaching point for a conference that I can put in my toolkit. I often envision my own conferring toolkit like a large handbag with many cards in it, and everytime I confer with a child I place a new card in my handbag. Each time I revise one of those cards I make a new card. I think that multiplying factor is what gives me the motivation to just sit with a writer and talk about what they are doing as a writer. It removes the intimidations that I once had, because I know this conference will be added to a new card to place in my handbag. I know that when I sit with a student I can always pull one of these cards from my handbag, if I need to. Thinking about revisions in this way extends the conference from that one conference or that one writer to every conference or every student I will confer with over the course of my time talking with writers. The potential is truly limitless, especially when I reflect, share and collaborate with colleagues. 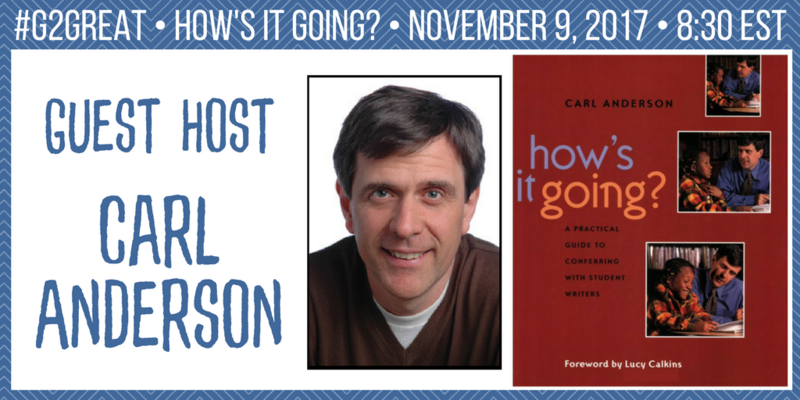 Carl Andrerson brilliantly starts conferences with “How’s it going?” This simple, yet powerful question opens up so many possibilities and extends beyond a writing conference. His book, How’s It Going? is one of my most reread and worn books. 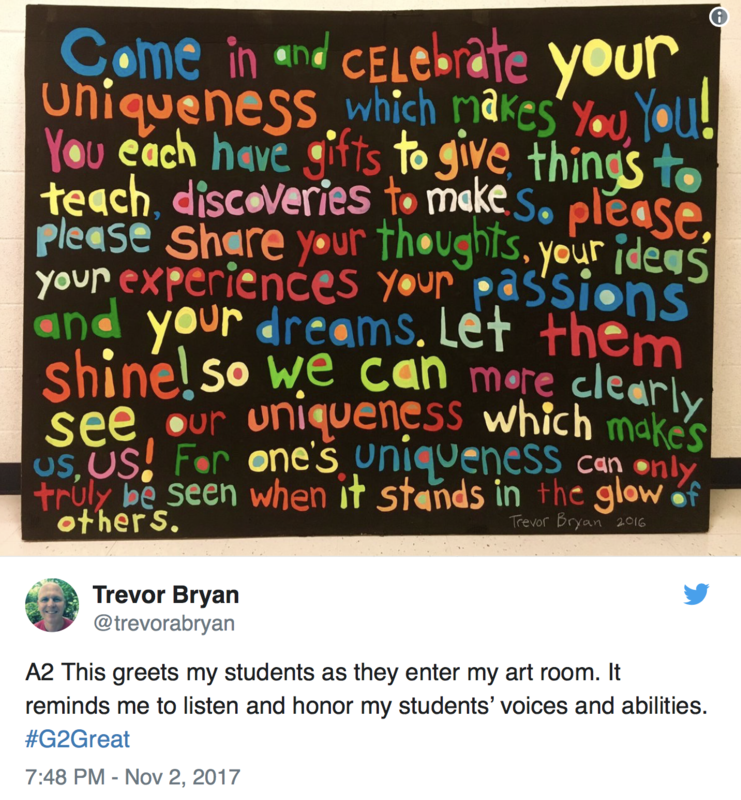 His first tweet of the #G2Great Twitter Chat included his perfect question, “How’s it going?” This demonstrates the power of the question and the insight that Carl shares with us. It carries over to all areas of meeting with children, just the other day I had the opportunity to sit down with several children in the principals office and the first thing I said was, “How’s it going?” It provided an opening to a conversation, it established relationships and allowed time for reflections and revisions in our thinking. John and AJ open their book by reminding us that time is a precious commodity. Through their calculations, we realize that we are all given the same 400 minutes in each day. But that’s where the similarities end since how we choose to expend those minutes varies widely from teacher to teacher. I love AJ’s point that we may not be able to control all of our minutes due to the inevitable and ever-present school requirements, but we can and must choose to spend limited remaining time in the most responsive ways. Eugene eloquently emphasizes that when time is finite, it is even more important that our choices reflect what we value. How we spend time is a choice so we lose right to complain about time when we choose to spend it in ways that do not positively impact students. I suspect that most teachers would be hard-pressed to suggest that creating classroom experiences that are creative and innovative is not a crucial instructional goal. Yet what we acknowledge pales in comparison to how we demonstrate those beliefs through our day-to-day actions. AJ’s words that creativity must be “unleashed” rather than “found” illustrates that this isn’t about merely identifying obligatory sporadic moments in the schedule but taking specific actions that will inspire creativity and innovation in ways that in turn inspire students and teachers to want even more creativity and innovation. Matt reminds us that we do this by ensuring students play a role in our instructional planning conversations as we make student voice and choice a priority. This idea that student voice and choice is an essential component of each learning day is a perfect segue to zoom in on choice as a primary factor of empowerment. AJ emphasizes that choice leads to ownership and thus empowerment and deep learning. This means that our willingness to offer choice in the learning process can have a positive or negative impact on student learning. Fran made the point that for many children, this has not been part of their ‘school game’ reality. This inspires us to begin to craft a new reality as we incorporate choice into each learning day and do so in the most authentic possible ways. Any time the discussion turns to empowerment, technology will inherently become part of that conversation. Technology reflects the world that our students reside in and so it makes sense to invite that world into our classrooms. AJ reminds us that technology is not a curriculum add-on but a powerful tool that can be seamlessly integrated into every learning day. I love AJ’s description of technology as an “on-demand experience.” This motivates us to shift our perspective from an activity we schedule to what we can bring to the learning table any time of day. Roman also reminds us that breaking down our school walls to willingly incorporate technology opens this world to students and expands their horizons and our view of what is possible. I found myself reading and rereading chapter 9 (page 147 to 156) as I was intrigued by these distinctive terms. I was clearly not alone in my fascination since many others took notice of this notion as well. AJ helps us understand these terms by considering one as an end point (Fail-URE) as often reflected by grades or test scores while the other is viewed as learning that can change over time (Fail-ING) through experiences that will support new or growing learning. I loved Rebekah’s description of Fail-ING as a process of ‘evolution, forward movement, and growth.’ This view celebrates the messy process of learning that occurs when we are willing to give students time and support to view that mess as a learning opportunity. AJ highlighted a key goal that can help us dramatically accelerate our impact potential. Empowerment is not simply what we do during the learning day but what students are able to do after the learning day is over when they leave our care. Our children will live in the world of the future and so we create learning opportunities that will prepare them for that world because we believe that they could make a difference by making that world a better place than it would have been without them. Vicki reinforces this point by referring to the ripple effect that can move learning from our personal instructional space out into the world that exists beyond that space. I smiled when I read the title for chapter 8: “Assessment should be fun. No, really we’re serious.” (page 125) It’s hard to envision that spirit given the current testing and grading climate. Yet AJ asks us to acknowledge that effective assessment (the “fun” kind) is about much more than a grade. Authentic assessment invites students to become an integral part of those assessments. Amanda reminds us that this is not about a grade or score that focuses on a product but the process students engage in as they are immersed in that learning experience. Once we are willing to adjust our emphasis on the process, we make room for students to ssume a central assessment position. In our final chat question, AJ acknowledges that empowerment is not about giving students free rein but widening our perspective as we incorporate a more flexible view. He reminds us that this is not an either-or proposition since we can offer students a supportive structure while still making room for empowerment through student choice in content. Christina reinforced this point by emphasizing that we must relinquish our control as ‘keeper” of every learning experience in order to open the door to discovery. When we create an environment that feeds student-inspired curiosity, then discovery and empowerment are likely to follow. 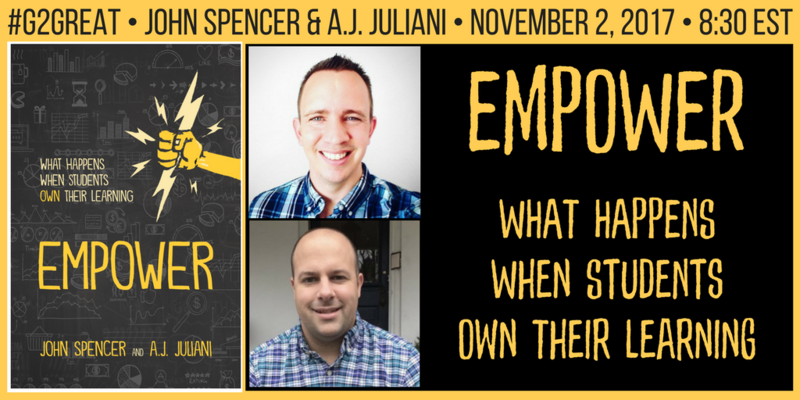 When I wrote our #G2Great chat questions as I read Empower, little did I know that John and AJ would not only inspire those questions but also inspire this post. 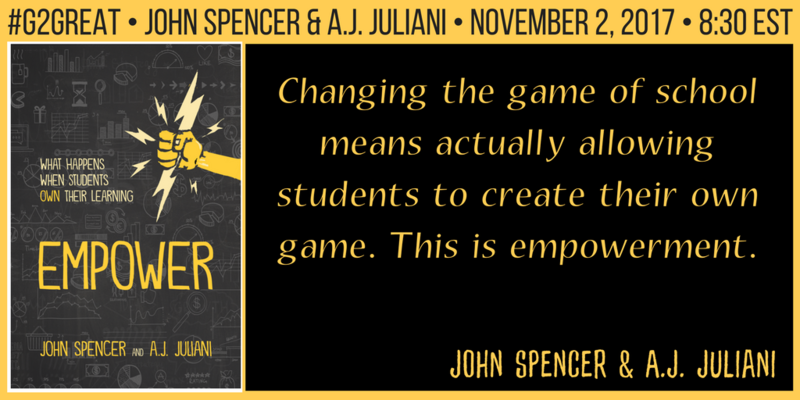 Through their book and our #G2Great chat we are given an opportunity to initiate an exploratory venture that addresses my initial question: “How can we EMPOWER students to create their own school game as a means to maximize learning?” As I look back on our chat, I think this begins by giving ourselves permission to invite students to OWN learning and thus craft their own game. I can’t imagine a more relevant goal to work toward. We are so grateful to John and AJ for moving us ever-closer to empowering student learning and we know that we are about to launch on a worthy and exciting journey side-by-side with our student. Perhaps the first step in this new game plan is illustrated in a tweet from Trevor Bryan.